Waffles are one of the best ways to use up your starter and add a little love into breakfast or brunch. I actually prefer it to the pancake recipe, but I know not everyone has a waffle iron. There are ways around this, like using a griddle or grill pan, or even buy these cool silicone waffle molds for the oven (there are even some in the shape of a heart), but in the end you may want to beg a friend to loan your theirs. It is SO worth it. The best part is you can save the leftovers and just pop them in the toaster the next day. We’ve even frozen them and waited for a lazy Sunday morning where we didn’t want to do anything other than kick up, grab a cup of coffee, and load up on a stack of waffles drizzled with maple syrup and fresh fruit. Do not overmix the batter — a few lumps are okay. 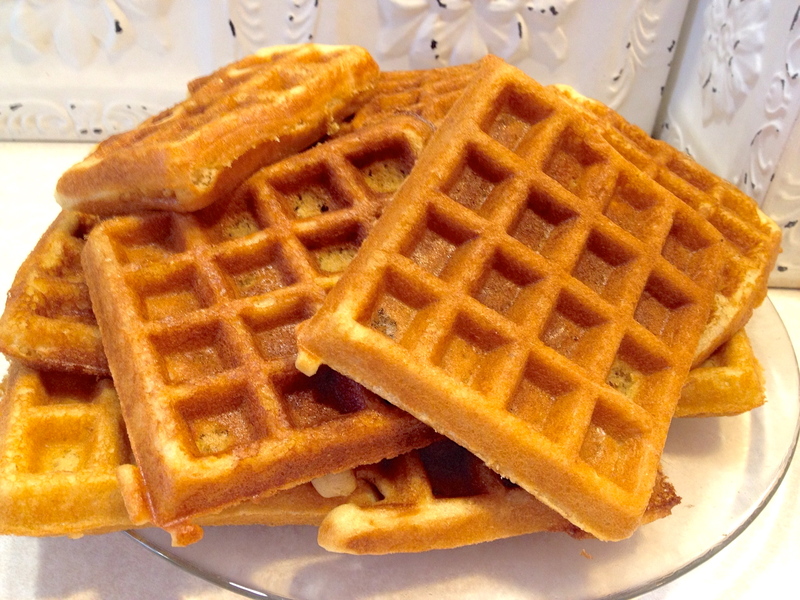 If you like your waffles crispy, reduce flour to ¾ cup and add ¼ cup cornstarch. If you plan to serve the waffles all at one time, heat the oven to to 200 °F (or 93 °C) and place the finished waffles directly on the oven rack until ready to serve. The perfect weekend accompaniment: Amish Friendship Bread waffles topped with sliced bananas and fresh maple syrup. Combine flour, salt, baking powder and baking soda in a large mixing bowl. In a smaller bowl, combine oil, Amish Friendship Bread starter, milk, and egg. Add ingredients of smaller bowl to the ingredients of larger bowl and mix on medium speed. Spray waffle iron with non-stick cooking spray and pour batter onto hot waffle iron. Cook until golden brown. This recipe is courtesy Suzy at Kitchen Bouquet. 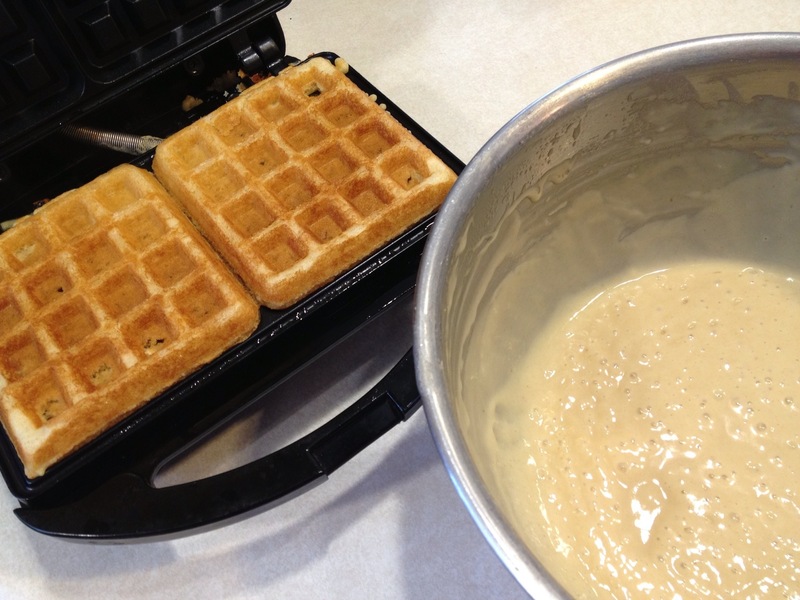 Make the waffle batter up to one day in advance and whisk well before using. 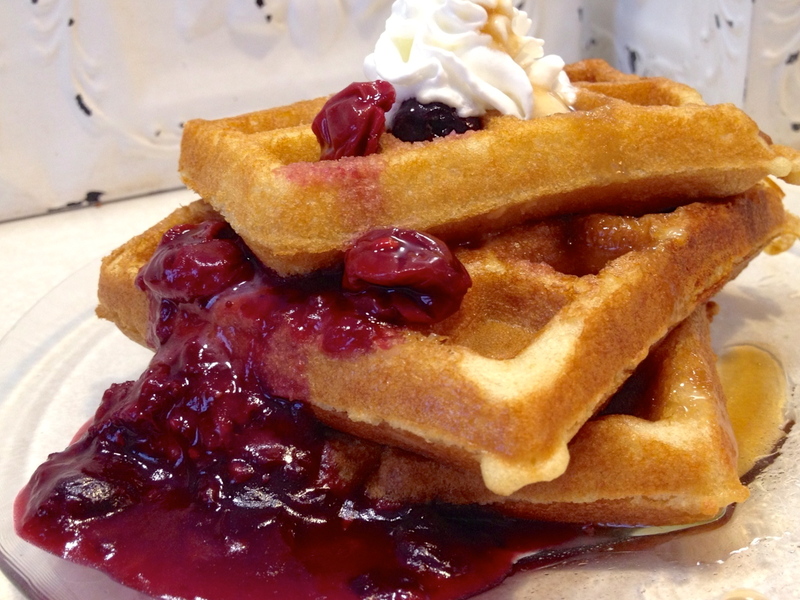 Top hot waffles with 1 cup fresh or thawed blueberries, strawberries, or bananas for an extra treat. From Paula Altenbach: "To avoid an overly sweet waffle, I used Amish Friendship batter that had been fed a day earlier and allowed to consume some of the sugars. These came out of the Belgium waffle iron steamy and tender without being overly sweet. We dropped them in a toaster to keep the crowd fed at their own pace." I do the same thing except I will add crumbled bacon and pecans in the batter. At times I will even make the batter a bit looser and make pancakes with it. Scrumptious! I made these and added a t. and a half of vanilla flavoring and than blueberries. It tasted very yummy!! Had these for lunch today! Wonderful, my family loved them. I used 1/4 c. oil and 1 tsp vanilla. Definitly will make these again and again. We made these this morning & they were fantastic! You can taste the sugar, so I didn’t use syrup.They would make a great dessert or my daughter said to somehow make crepes with the batter?? We also did the powdered sugar, fresh strawberries, I reduced the oil & used vanilla. My only complaint was that they were limp. Would definitely make them again! Made these today! Fast, easy, yum! I made these recently, and although they were delish and sweet, they stuck badly to my waffle iron and were quite limp (the ones that did not stick), so finally I made the rest into pancakes instead. I’m making these tonight! I’m adding maple extract, cinnamon, and pumpkin pie spice. Hoping to freeze them and stop buying waffles at the store! These were soggy waffles!, I had to make them into pancakes. Bummer! Saw Bobby Flay making coconut waffles so I’m thinking of using the waffle recipe & replacing the milk with coconut milk & adding 1/3 cup shredded coconut. I’ll let you know how it all turns out. Wow, these were incredibly sweet! Two of my kids refused to eat them because they were just too sweet. Any idea how to remedy that? You could reduce the amount of sugar in your starter, Stacey. Up to half should work fine. Good luck! That’s great, Margaret! Thanks for sharing! I love yeast waffles and these look so tasty. I almost can’t wait to try them(but I have to). Does mixing the batter and leaving it overnight in the refrigerator help the batter to not stick to the waffle iron as much? Don’t try to even check them for doneness until there is no steam coming from the waffles…or they will stick, tear in half, etc. I replace ¼ cup of flour with the cornstarch and add about ½ teaspoon vanilla. Hi Sally! That’s such a fun idea. If you snap a photo of your Amish Friendship Bread Waffles next time you make them, we’d love to see it! You can submit your photo here.